Shure KSE1500 review | What Hi-Fi? We’re no strangers to premium priced gear at What Hi-Fi?, but even we took a collective gasp at the £2500 price tag attached to Shure’s new range-topping in-ears, the KSE1500. In-ears have a hard time with perceived value at the best of times, but before you write these Shures off as an exorbitant luxury for those with more money than sense, take a closer look. Once we started delving into the technology and engineering involved that scary price looked more understandable. The KSE1500s use electrostatic drivers. It’s the first time we’ve reviewed in-ears with this technology, and it gets us thinking that these headphones might be worth taking seriously. Electrostatic technology is rare, and for good reason. The working principle is fairly straightforward, involving a very light diaphragm loaded with static charge placed between two metal grids. As the music signal is fed to these grids, they vary in polarity accordingly, so causing the diaphragm to move. This movement is translated into sound. It may appear simple, but it’s complex to put into practice and difficult to engineer properly due to the high voltages involved. It took Shure eight years of development to get the KSE1500s to market. Why go to all this trouble? The diaphragm is driven across its whole surface, which combined with the light weight – compared to traditional cone alternatives – means that distortion levels are tiny and the response to any signal, even the tiniest nuance is fast. Simply put, a well-engineered electrostatic design will give you a more detailed and accurate sound than conventional alternatives, all other things being equal, which they usually aren’t. One disadvantage of using such a technology is that the KSE1500s need a dedicated amplifier. The unusual electrical demands of electrostatics mean that normal headphone amplifiers, including those built into phones or tablets, just won’t work directly into the headphones. This dedicated amplifier accounts for a sizable chunk of the Shure’s hefty price and is included in the package. The amp pack is beautifully made. It’s solid and feels like a quality item. We particularly like the knurled volume control, and the display is clear, if a little small. There are two inputs – a 3.5mm line level connection and a micro USB. There’s also a digital-to-analogue converter on-board, which is capable of accepting PCM signals up to 24-bit/96kHz. That’s a little disappointing. We would have expected at least 24-bit/192kHz, and for this price, DSD compatibility too. The amplifier will digitally connect to phones and tablets, though. Android devices will need to be able to output audio through their USB connection for this to work, while Apple’s iOS units should work without issue. Delve into the menus and you’ll find equaliser functions. There are presets to boost bass and cut highs, even one to de-emphasise sibilance. There’s also the provision for fine-tuning these settings to taste, and that’s useful. Battery life is around 10 hours if you’re listening through the line stage and around seven hours if you’re using the DAC and equalisation functionality. Unpacking the KSE1500 is a treat. It comes in an elaborate box packed with a good range of cables, adaptors and a rather fetching leather case. It makes a fine first impression and that positivity only increases once we start listening. We find these comfortable to wear. As with all in-ears it’s vital that you find the right tips, and Shure provides a generous spread of sizes and shapes to provide the best seal. The leads also loop around the ears for additional security, which is great when you’re on the move. In such circumstances it helps that the KSE1500 are good at blocking out external noise. Shure claims 37dB of noise isolation – note that these aren’t noise cancellers – and that rings true as we walk through our busy office or out on a noisy high street. If you’re expecting to be blown away by the sound the KSE1500 makes then you’ll be disappointed, initially at least. These in-ears major on accuracy and detail resolution rather than impressing through lots of bass or emphasising punch. Our first reaction when putting them on is that they sound a little understated, but that impression soon changes as we discover just how insightful and well balanced they are. They’re wonderfully clean and clear without sounding either bright or forward. Their tonal balance is spot-on in fact, and the transition from deep bass to the highest treble, utterly seamless – the latter no surprise considering they use a single electrostatic driver per side. Electrostatic technology’s inherent lack of distortion also makes them easy to listen to over long periods. Transparency is of the highest order. They reveal the natural warmth in the beautifully recorded Mount The Air by The Unthanks with ease. The lovely vocals come through with immense subtlety. There’s no shortage of nuance, these headphones delivering each change of intensity and emphasis with considerable skill. They communicate the dynamic ebb and flow superbly too. Move to Kendrick Lamar’s King Kunta and the Shures respond with wonderfully textured bass and an enviable ability to organise and stay composed even when the music becomes busy. They always sound in control without going so far as to take the energy out of the music. All that insight is great, but it does mean that these won’t hide the flaws in the rest of your set-up. Use something like Spotify and you’ll find the results thin, hard-edged and notably lacking in subtlety compared to well-recorded high-resolution recordings like Paul Simon’s Graceland. Everything we’ve described is how the Shures sound like through the line level input. The DAC section isn’t as good. It sounds thinner and less subtle, lacking the talent to shine in the same way with dynamics and pace changes. It’s still handy to have, though. Performance is merely good rather than great. While these headphones will work with phones and portables you’ll only really hear what they’re capable of with top-end hi-fi sources. That’s the dichotomy of the KSE1500s. In-ears are by their very nature meant for travelling, but the only way you’ll hear them at their best is with talented home gear. Is there still a place for them? We think so, simply because they’re so good. 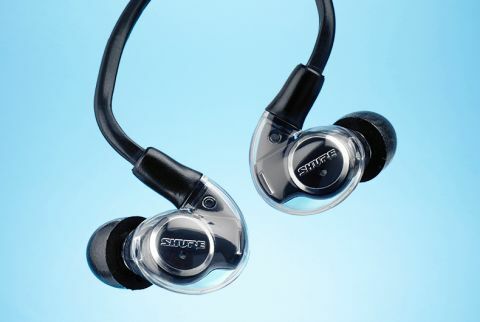 Calling these the best in-ears we’ve heard is selling them short. They’re among the finest headphones around, regardless of price or type.